Tractor Supply sells 50 pound blocks of trace minerals and salts. 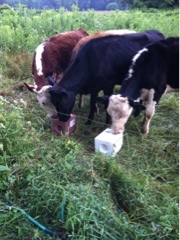 Along with kelp, we offer them free choice to our herd of cattle. They can have as much as they want, anytime. The organic kelp is a probiotic, a boost to the immune system that keeps them healthy. Some eat more kelp than others, and it is essential to provide after calving. The minerals and the salts are like us needing extra salt in the hot days of summer: as they move about, chew cud, eat tonnage of grasses they need the minerals to keep all their parts working. It takes months and months for our herd to use each of these up. They had a couple days where they ran out and then we got new ones to them, and they gathered around and hit it hard.